Running Time: 2 hr. 26 min. For proof positive of the critical capital that Jennifer Lawrence has already amassed, look no further than the early plaudits being heaped on The Hunger Games: Catching Fire, the second installment of the Suzanne Collins-penned trilogy. This otherwise banal actioner, with its darker-than-average themes, rests firmly on the able shoulders of its 23-year-old Oscar-winning star. And while Lawrence’s presence saites critics, her role as Katniss Everdeen is cobbled from a Whitman’s Sampler of pop cultural influences. She shoots arrows like Legolas. She’s embroiled in her very own love triangle—Team Gale or Team Peeta? And, her rise in status to societal savior from a totalitarian overlord is Neo-esque. Indeed, for all the Battle Royale and The Running Man allusions in the premise to The Hunger Games, its sequel is more akin to The Matrix Reloaded: a bridge film that laces its protagonist’s messianic maturation into a middling, muddled plotline. Fresh off their Hunger Games win, Katniss (Lawrence) and Peeta Mellark (Josh Hutcherson) are conscripted by President Snow (Donald Sutherland) into a victory tour to quell rising restlessness throughout the 12 districts. While Katniss and Peeta are able to mask their mutual antipathy for the cameras, they aren’t so good at hiding their distaste for Snow’s oppressive regime. Of course, the fact that Snow oscillates between entertainment diversions and public executions and floggings doesn’t really instill a sense of stability amongst the masses. So, Snow declares that the 75th Annual Hunger Games, aka the Quarter Quell, will feature tributes (players) who are reaped (chosen) from the existing pool of past victors. 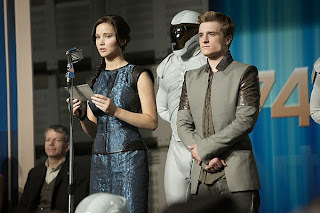 Snow confides in new game master Plutarch Heavensbee (Philip Seymour Hoffman) that this format is designed to purge the districts of tributes who have gotten too uppity, a concern that doesn’t appear to actually exist until Snow breaks the pledge of lifelong financial security made to those who previously survived the gauntlet of the Games. Although this Hunger Games: All-Star Edition promises a cunning competition like none before, the way the narrative eventually unfolds—culminating with an abrupt cliffhanger—utterly undercuts this construct. While there’s nothing inherently wrong with Jennifer Lawrence in the spotlight, Catching Fire is essentially two-thirds fashion show and one-third recycled action sequences. And amid the dourness, only Stanley Tucci—all ponytail and pearly caps—provides any perceptible energy as TV emcee Caesar Flickerman. Indeed, whatever profundity is in Catching Fire concerns the manner a co-opted media is a powerful, dangerous weapon in the hands of a government trying to tame its populace. Still, this hardly revelatory concept isn’t enough to fill the 146-minute running time—indeed, The Hunger Games is what viewers play who watch this film on an empty stomach. And if that’s still not enough Katniss and Co. for you, take heart that Collins’ final book, Mockingjay, is going to be split into two films. You know, like Twilight: Breaking Dawn and the entire Hobbit series. What could go wrong with that?